EVENTS - Raqs Without Borders 2019: MENA dance festival in NYC: 08/24/19-8/25/19. Registration is now open! Fourth Annual Middle Eastern and North African Dance Festival, RAQS WITHOUT BORDERS in New York City: dance workshops with inspiring instructors, a dance show with spectacular performers, lectures, and certificates of completion. 11am-1pm: shimmylicious tabla solo dance workshop, taught by Sal Elsayed. 1:30pm-3:30pm: Tunisian jug dance, taught by Habiba (an hour and a half Tunisian dance +half hour lecture). 4:00pm-6:00pm: modern oriental choreography with veil dance workshop, taught by Sal Elsayed. 11am-1pm: Egyptian Ghawazee dance workshop, taught by Habiba (an hour and a half Ghawazee dance +half hour lecture). 1:30pm-3:30pm: Classical Egyptian workshop with music by Abdel Halim Hafez, taught by Torkom Movsesiyan. Students will learn a choreography from Abdel Halim Hafez' song, "Zay Elhawa." VIP package is only $200, and it includes five dance workshops, a performance in our Saturday night dance show, two mini lectures, and a certificate of completion. With VIP package you save more versus registering for individual workshops. Individual workshops are $70 each, and do not include your performance and a certificate of completion. Saturday, November 17, 2018 from 8 PM – 9:30 PM. Doors open at 7:30pm Harlem School of the Arts Theater at 645 St Nicholas Ave, NYC 10030. Take A, B, C, or D trains to 145th Street and exit on Saint Nicholas Avenue. Walk half a block to HSA Theater. cultural expression of Raqs Shaabi, the dance of the people in Egypt. also help students strengthen their technique and emotional expression through the music of Um Kulthum; allowing students to use their improvisational skills as they explore Um Kulthum's unique style of uniting of earth and spirit, strength and grace, intensity and inner peace, and sensuality. One workshop: $50. Save $20 on both workshops: $80. Send check, SASE, and your legal and dance names to 110 Elm St., Apt. 4, Groton, NY 13073. Please indicate which workshops you’ll take and whether you would like to perform. Contact: 607-351-7206 or Quayyum at origamijeweled@gmail. com for more information. Preregistration is required by April 21st, 2018. Space is limited, so don’t wait! Artist Bio: Torkom Movsesiyan is a cultural ambassador of the arts, who envisions Middle Eastern dance as a diplomatic tool in cultural diplomacy. 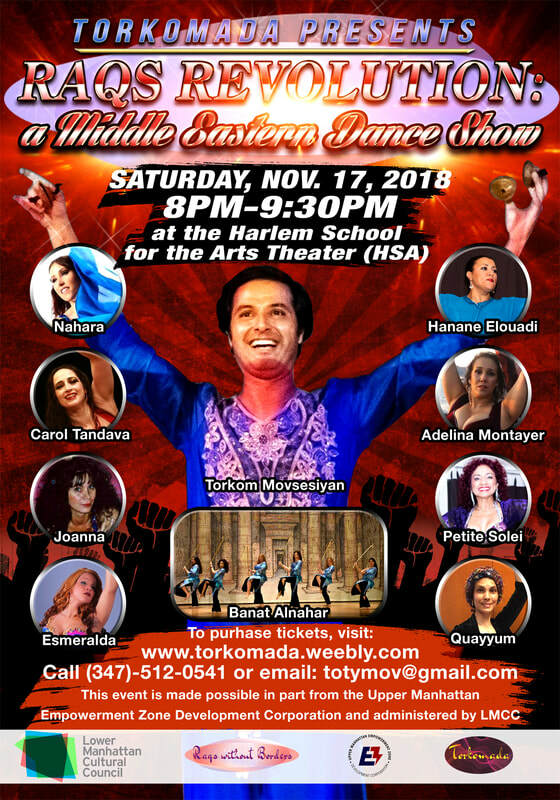 His annual award-winning Raqs Without Borders (a Middle Eastern Dance Festival in NYC), www.torkomada.weebly.com, is an original contribution to the world of art and diplomacy, awarded by NYS Council on the Arts, Department of Cultural Affairs of NYC, Lower Manhattan Cultural Council, Brooklyn Arts Council, and the CUNY Dance Initiative. Torkom's distinguished art has been featured in the Jon Stewart Show, HBO, Everyday with Rachel Ray, the Discovery Channel, Lincoln Center, the Daily News, the UN, and TimeOut NY. He holds an MA in International Affairs and an honors BA in International Studies from CUNY. 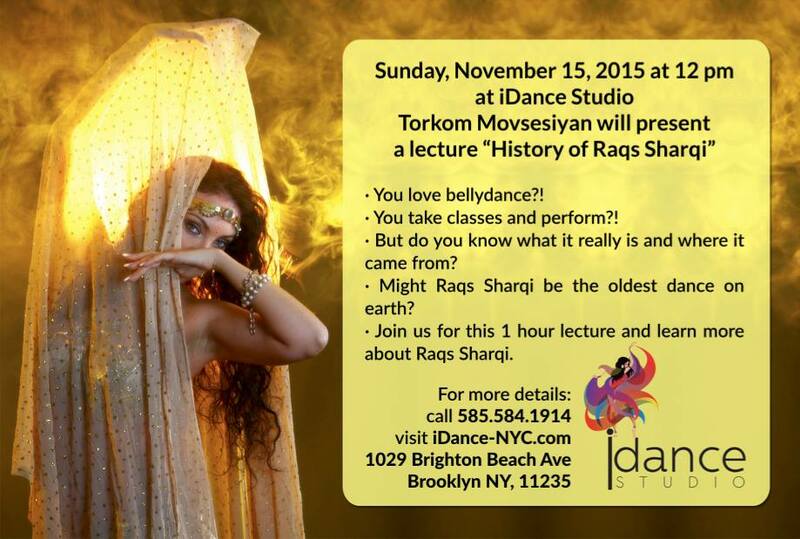 This class breaks down the movement vocabulary of Raqs Sharqi, a traditional Egyptian dance, more popularly known in the West as "belly dance." After brief explanations of the history of this ancient dance and a warm-up routine, participants will be taught a short choreography. This class is open to all levels-beginners to advanced. Bring a comfortable dance outfit: flat shoes or barefoot, skirt, leotard, tights, a top, and a hip scarf or shawl to underline your hip movement. The use of camera of any kind while class is in progress is strictly prohibited. Location: LaGuardia Community College, 29-10 Thomson Avenue, C Building, Room 401, Long Island City, NY 11101. Subway: Take a Queens-bound 7 train to 33rd street (Rawson Street).